Gaku jutsu 学習 is the science of learning or study. And the Bujinkan requires 限り無い の 学習 kagirinai no gaku jutsu, an endless study. Today at the honbu we were lucky Noguchi sensei gave the two classes as Sôke was busy. In these classes we studied some of the Takagi Yôshin Ryû and the Kukishinden Ryû and we covered many techniques from the various levels of the ryûha, namely: moguri gata, mutô dori, and shoden no Kata. With my partners Alfonso (from Spain) and then Mundo (from Mexico), we did our best to follow the crazy rhythm of teaching of Noguchi sensei. And the extreme heat didn’t help.You would think that all these are known by all of us by now. And it would be untrue. Noguchi sensei has been teaching at the Honbu since the beginning and he is one of the oldest student of Hatsumi sensei. But it is always a pleasure to see him prepare a technique. His classes always follow the same ritual. He places his notebook by sensei’s door on a stool and studies the text for a few minutes before demonstrating it to us. It is like he is discovering the waza for the first time, and to me this is the true gaku jutsu.Each time he comes up with a new version of the techniques. I have been studying under him for nearly twenty five years now, and I’m always surprised to rediscover these waza as if they were new ones. In fact,when Noguchi sensei reads the text thoroughly he reinvent it completely.After so many years with Hatsumi sensei, one can expect the Japanese Shihan to “know ” the techniques. That would be wrong. They are students. Very advanced ones, but they are still learning and studying. I wondered many times about this and my conclusion is that they don’t learn the waza by heart in order to keep the freshness of creativity. These is what studying is about. Recently at the Paris Taikai, my friend Sven said that: “we learn and study in the dôjô with the teacher, and then we train “. This is the way the Shihan do their training, they teach new possibilities each time.I have been studying these same techniques with him many times. I trained them a lot to the point that I even committed dvd’s on these techniques. I taught them in many seminars over the planet, but when I’m studying in Japan, it is as if the techniques are new to me and I feel lost like a real beginner. This is how gaku jutsu works.This is why I call what we so here in the Bujinkan the kagirinai no gaku jutsu, the endless study. There is no definitive answer. Waza are not chiseled in granite, they are ideas to be interpreted anew each time you study them.This is possible in Japanese because the Japanese language processes with images and not with defined objects as we do in our western languages. So please take some liberties with the texts you have gathered over the years if you want to save your creativity. Don’t do your own thing. Each waza carries within some kaname not to be discarded. But keeping those essential points feel free to adjust the form to the feeling of the day and/or the theme of the year. This is the same with sensei ‘s books and dvds! And you are surprised to discover it when you have the chance to record a Quest dvd with sensei, because this is exactly the same creative process. We meet usually at the honbu dôjô and we are given a technique to demonstrate. Each one trains and, when asked by sensei, we show our interpretation of it (trying to stick as close as possible to the form demonstrated to us). Then sensei simply does a henka on what we just did. Many Bujinkan followers think that these dvds represent the “correct form “. It’s wrong, they are only sensei’s feeling of the moment. 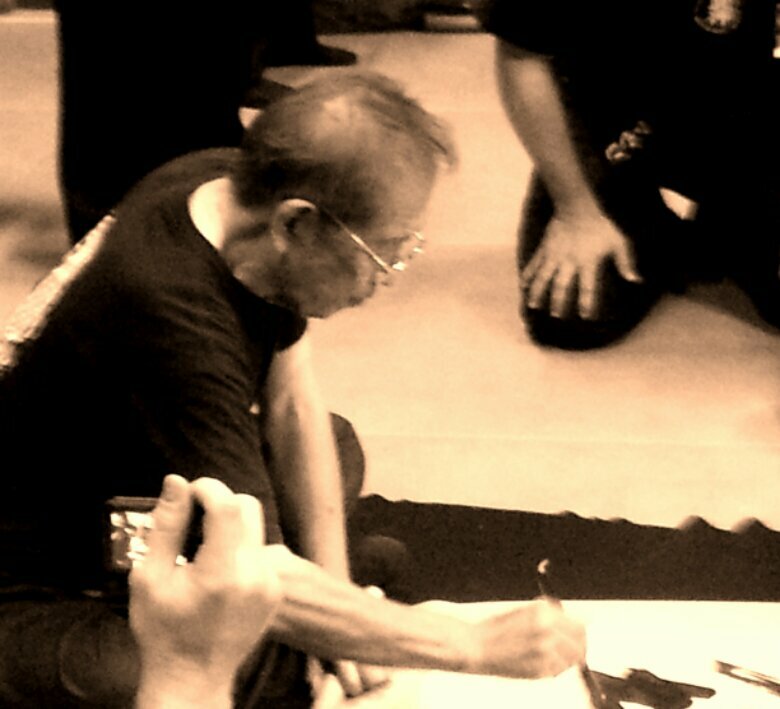 When he was traveling the world, sensei would give more or less the same techniques at each Taikai and when you were lucky to follow his “world tour ” you would study them each time with a different approach. In 1997, I studied the first technique differently in Paris, New Jersey, Barcelona, and Tokyo!This originality of the Bujinkan martial arts is what makes it so valuable compared to the other arts. It also explains why each Shihan teaches these same techniques with a total different approach. One day I asked Sôke if it was logical to think that when in Japan I had the impression to study the Bujinkan with him, but also the Nagato Ryû, the Oguri Ryû, the Senô Ryû, and the Noguchi Ryû? “Yes! ” was his answer. Our richness lies in the diversity of our interpretations. Our unity is based upon our diversity. For example if five persons are asked to draw the same tree, you will have five different visions of the same reality. But each tree will have roots in the ground, a trunk, and branches. It is the same with the waza. Like true artists, we express what we are in the instant. Do not kill the techniques by forcing them into a dead form, on the contrary read them each time as if they were new and interpret them to the best of your ability. Saino konki. what a great piece you have written, which explains so much in palatable terms for students at all levels. For years everyone has wondered why the form of each waza was different from person to person, Shihan to Shihan and of course in so many cases from day to day. For years students take their newly found waza away to study and in many cases take them as gospel and portray them as the ‘proper version’. I guess we have all been there haven’t we. This is Kasumi Dori from Takagi Yoshin Ryu and you do it this way. Like Soke has said in the past, nobody is necessarily wrong in their interpretation. They just have to develop their own interpretation of the basic waza through their individual on going study. In reality as we are all individuals so is our budo. You can create, but you need…, basics = Kihon = so much training!